This new cereal is a disappointment. Its brown sugar flavor is bland and lifeless. It delivers on the crunch, but annoyingly so. There's a fine line between something being crunchy and something being just plain hard. This cereal dances stubbornly on that line. On the plus side, I was going to throw this cereal away. After a second try, I decided I could trudge through a couple more bowls so as not to waste food. Starving kids in Africa would gratefully eat this cereal. Oddly enough, the best part of this cereal is the milk it leaves behind. There, you can taste the brown sugar with distinct notes of caramel. This begs the question, "How did they get all the flavor to leave the cereal pieces when milk is applied?" There are two groups of people who might like this cereal. The first is people who treat crunchy cereals like others treat hot sauces. This cereal pushes the boundaries of crunch. If you're looking for the ultimate crunch... a crunch so crunchy that your mouth might hurt, this is a cereal for you. The other group that may appreciate this cereal is the aforementioned starving children in Africa. Nutritional Considerations: Each 1 cup serving has 200 calories, 2 grams total fat (0 grams saturated and 0 grams trans), 0 mg cholesterol, 140 mg sodium, 44 grams total carbs, 5 grams dietary fiber, 12 grams sugar and 6 grams protein. 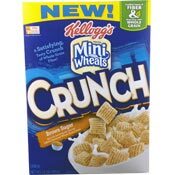 What do you think of Mini Wheats Crunch? It takes all kinds to make the world go round; but I totally disagree with you all! Finally! 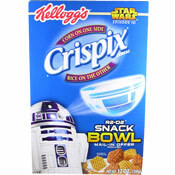 A cereal that says crunchy and actually is crunchy. My only peeve is it is no longer found on grocery store shelves and I could not taste the brown sugar. Truly awful. The first cereal I have had in probably 10 years that I could not finish a bowl of. I didn't like them in milk, but it's not bad dry. I take a small bag in to work to snack on during the morning.